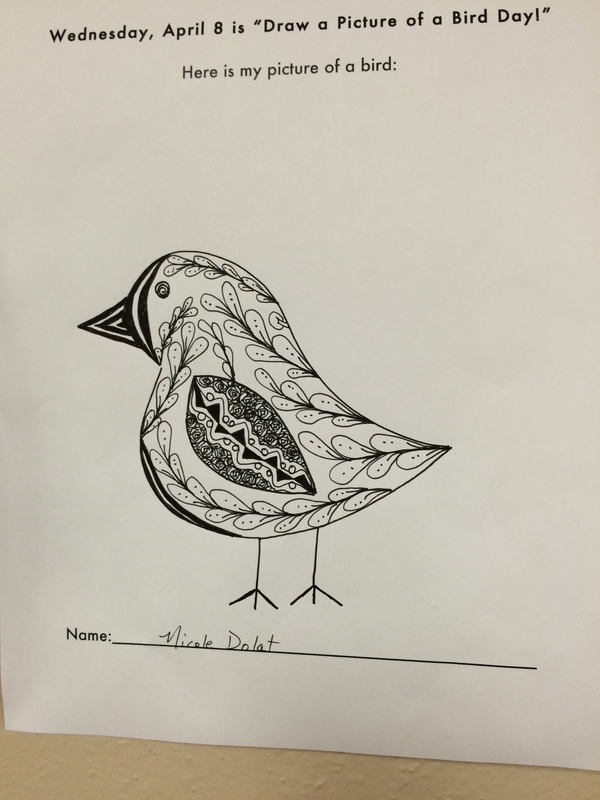 Last year the Cheshire Library celebrated Draw a Bird Day by having staff make their own bird drawings. 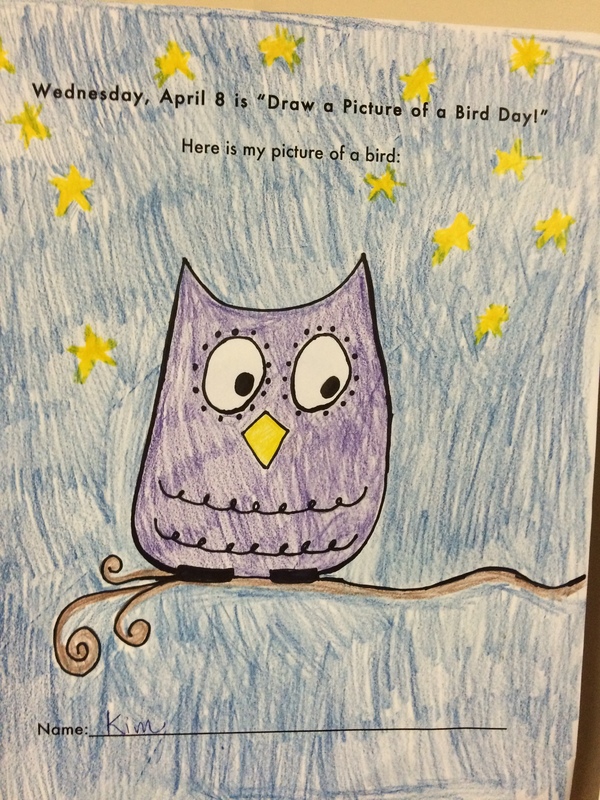 This post appeared a few weeks later, describing the experience and the significance of Draw a Bird Day. 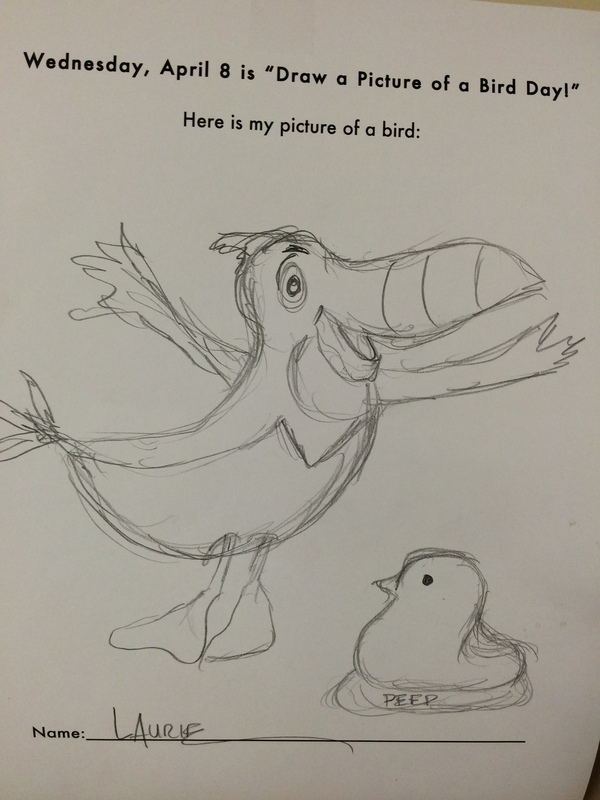 Here it is again, for those who wish to know the story behind Draw a Bird Day. In 1943, Dorie Cooper was a 7 year old living in England. Her mother took her to a hospital to visit her uncle who was wounded in the war. While they were there, Dorie’s uncle was very distraught, having lost his right leg to a land mine. In an attempt to cheer him up, she asked him “Draw a bird for me, please.” Even though he was unwell, he decided to do as Dorie asked. He looked out his window and drew a picture of a robin. On April 7, 2015 the director of the Cheshire Library put a piece of paper into everyone’s mailbox. 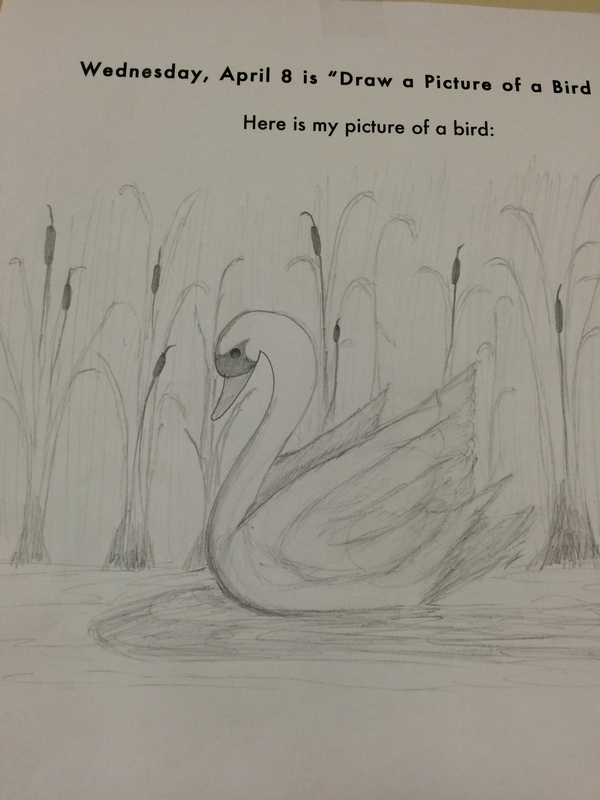 The page was blank except for one sentence across the top: Wednesday, April 8th is “Draw a Picture of a Bird Day” followed by the line: Here is my picture of a bird. What fun, I thought and took my paper home to plan a drawing for the next day. 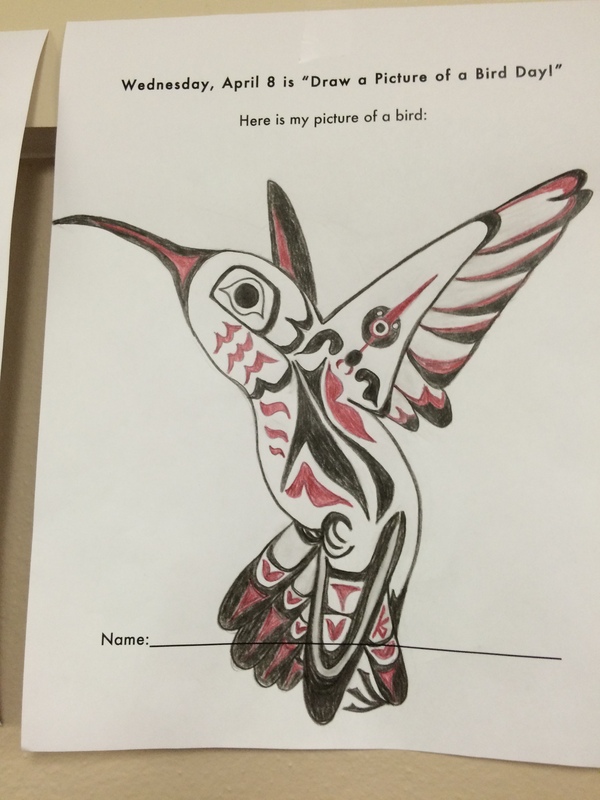 On April 8th when I arrived at work, several staff had created bird drawings. There were all types from simple line drawings to colorful sketches. Owls, doves, robins, swans, and hummingbirds found their way onto the wall of our staff room. 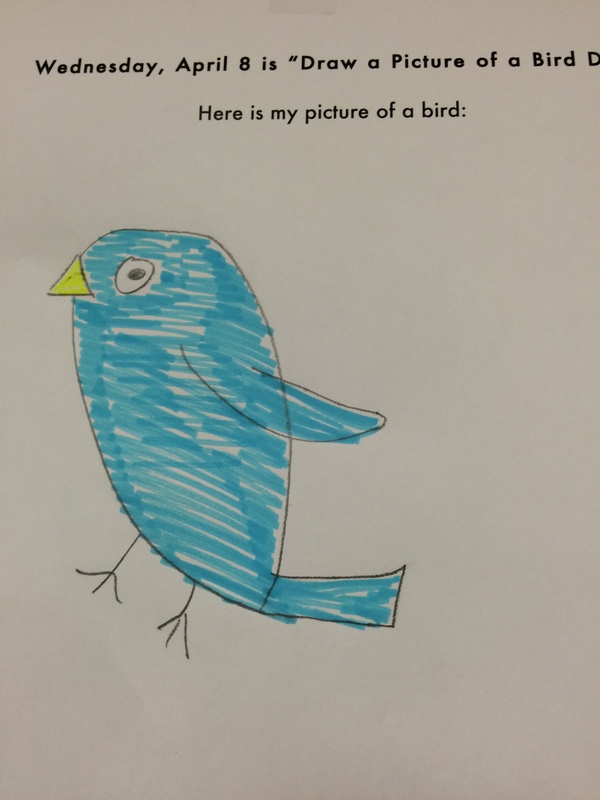 After seeing her uncle’s bird picture, Dorie laughed out loud and proclaimed that he was not a very good artist, but that she would hang the picture in her room nonetheless. Her uncle’s spirits were lifted by his niece’s complete honesty and acceptance. Several other wounded soldiers also had their day brightened by the event and every time Dorie came to visit thereafter, they held drawing contests to see who could produce the best bird pictures. Within several months, the entire ward’s walls were decorated by bird drawings. The next evening, as I was standing there looking at the pictures, I became curious about the source of Draw a Bird Day. So, I did some research and discovered the Draw a Bird Day website. I read with interest about Dorie and her uncle. And then came the third paragraph. 3 years later, Dorie was killed after being struck by a car. At her funeral, her coffin was filled with bird images that had been made by soldiers, nurses and doctors from the ward where her uncle had been. Ever since then, those men and women remembered the little girl who brought hope to the ward by drawing birds on her birthday, April 8th. I was stunned. Dorie, the girl who had loved bird drawings, died at age ten? That was not the way I was expecting the tale to end. And then I read a little further. Draw a Bird Day was never declared an official holiday, but it grew through those soldiers and medical personnel and their families. Today, it is celebrated world wide as a way to express joy in the very simplest of things in life. I went back into the staff room and looked at the bird drawings again. I had enjoyed making my drawing and viewing the drawings of my coworkers. It had lifted my spirits to make that picture and to see the creativity of the people I worked with. It had, in fact, the same effect that it had in that hospital ward all those years ago. 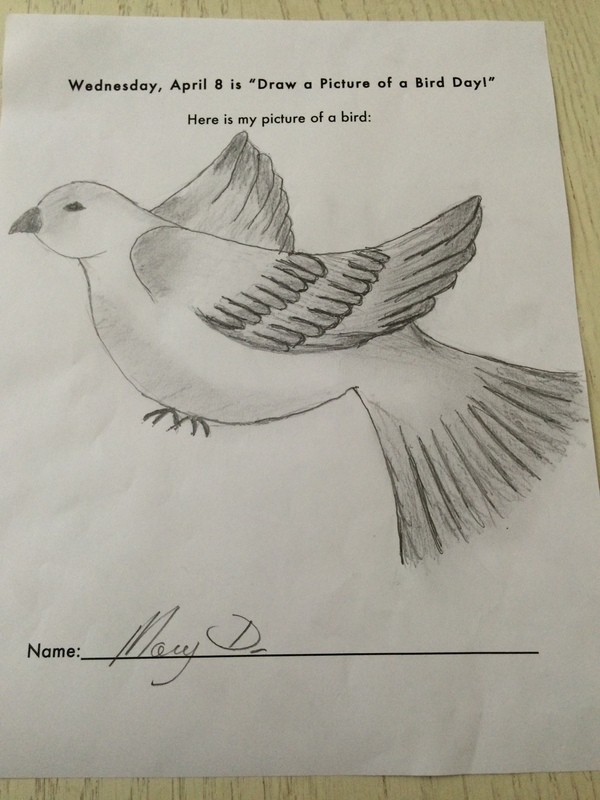 Seventy-two years after a little girl asked her uncle to draw her a bird, people all over the world are still drawing birds on her birthday. Still celebrating hope and happiness. Still celebrating joy in the simple. Still sharing the fun.